In September, Patsy Beattie-Huggan (President of The Quaich) traveled to Belleville, Ontario to facilitate a workshop for the Healthy Communities Partnership of Hastings & Prince Edward Counties. The purpose of the event was for Partnership members to review research, dialogue on activities, and create plans for partnership development and implementation of policy priorities. Patsy introduced the group to the Circle of Health, using it to illustrate the value of having a shared understanding of health promotion and a shared language for participants to use in collaborations. Participants also used the Circle of Health to see the links and relationships in the work of their respective organizations, and as a framework for planning health promotion initiatives. 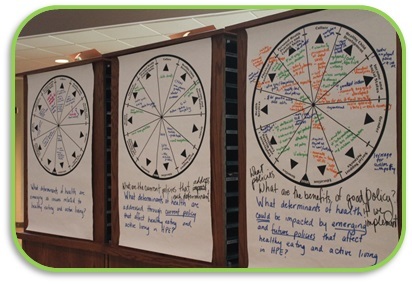 Feedback from the workshop showed that participants were positive about the Circle of Health. It helped to reinforce their values, and the visual aspects of the tool helped them to see interconnections between participants attending the workshop.